Many interior paints contain Volatile Organic Compounds (VOCs) in the form of solvents, some of which can be harmful to your health. So when a container of Dutch Boy Refresh paint proudly declares “Zero VOC,” one might reasonably think “Yay, no volatile organic compounds for me.” Well… maybe so, maybe not. The Federal Trade Commission recently charged Sherwin-Williams, makers of Dutch Boy, and PPG, the folks behind Pure Performance paint, of making false claims on their products with regard to possible VOC content. See, while the base white paint in that container of Dutch Boy Refresh might lack VOCs, that changes the second you add just about any tinting to get the desired color. 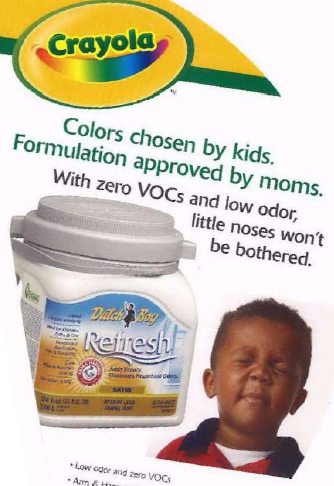 “The vast majority of Dutch Boy-formulated colors of paint are not zero VOC after tinting Dutch Boy Refresh base paints with respondent’s colorants,” claimed the FTC in its complaint. “In truth and in fact, in numerous instances, Pure Performance paints do not contain zero VOCs after color is added,” alleged the FTC. Next What Happens If You Try To Hold A Board Meeting In The Office Chair Department Of Staples? Next Up: What Happens If You Try To Hold A Board Meeting In The Office Chair Department Of Staples?